One trio getting a lot of attention of late has been anthemic combo STRANGERS. Led by vocalist David Maddox-Jones, formally of the Parlophone signed THE DEPARTURE, his songcraft is augmented by Rachmaninov loving keyboardist Piers S Robert and one time Young Drummer Of The Year, Raife Hacking. 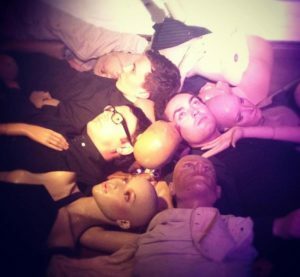 While their soaring choruses have drawn comparisons with HURTS and occasionally put them perilously close to COLDPLAY territory, their obvious love of DEPECHE MODE, THE CURE, NEW ORDER, TEARS FOR FEARS and JAPAN helps tip the sonic palette for some emotive escapist darkness over a contemporary electronic pop sound. Songs such as ‘If I Found Love’, ‘It Was A Sin’, ‘Bound By The Sea’ and ‘Human’ all display these thoughtful artistic elements while retaining the potential to be wholly accessible to the masses. But STRANGERS certainly don’t shy away from modern pop forms, with love publically declared for new cinematic divas such as LANA DEL REY and JESSIE WARE. Meanwhile STRANGERS have been impressing in all the right circles. Their previous single ‘Shine On You’ was commended by ERASURE’s Vince Clarke via Twitter and used by the BBC during their coverage of the Bahrain Grand Prix and to soundtrack a BBC montage of the 2012 Olympics opening ceremony and its “inspiring youth” message. In addition to all that, new single ‘Safe/Pain’ was used for a clip compiling Team GB’s immense cycling achievements. 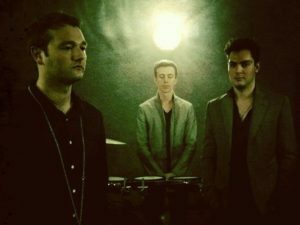 In a busy year, STRANGERS have opened for new highly rated electronic acts like NIKI & THE DOVE while also gaining prestigious support slots with classic artists such as BLANCMANGE and CLAUDIA BRUCKEN. During the latter show at London’s Bush Hall, they had the honour of performing in front of OMD and HEAVEN 17 plus PROPAGANDA, SIMPLE MINDS and ULTRAVOX producer Stephen J Lipson, thanks to the wonderful Synth Britannia All Stars guest format of Ms Brücken’s show. Judging by the positive feedback in the merchandising area and on the web after, STRANGERS’ triumphant performance was noted and will undoubtedly help the trio further to gain a wider audience. STRANGERS have been rightly or wrongly compared with HURTS and MIRRORS. 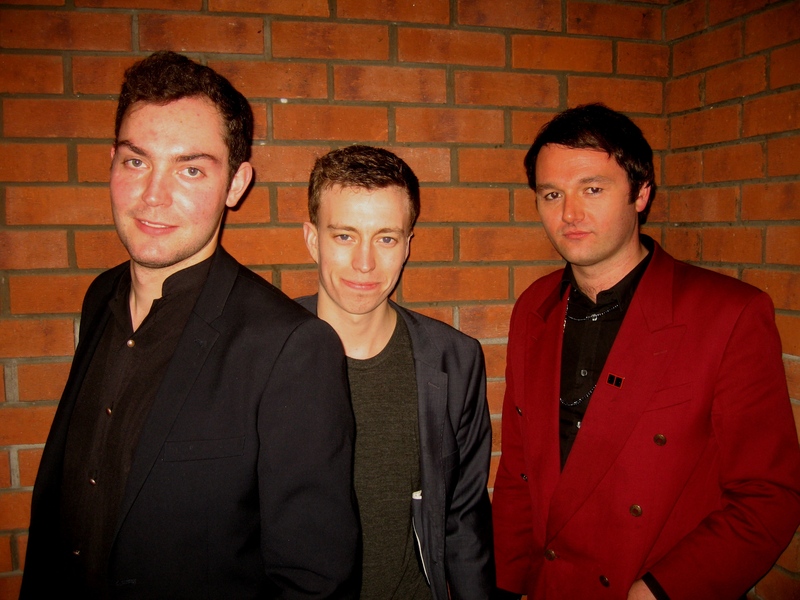 Coincidentally, MIRRORS’ singer James New was in a major label indie band like you were. What inspired you to take up a more synthesized template after your previous band THE DEPARTURE? Well I’ve always been into bands that would be classed as synthpop such as DEPECHE MODE, PET SHOP BOYS, and so after THE DEPARTURE I wanted to experiment with a broader sound pallet. Guitars can be quite limiting and using synths opens up a lot of doors creatively. Which acts have influenced STRANGERS the most in terms of overall sound? Well it’s quite hard to pin point as we listen to a lot of stuff. It’s always been about the song for us. We love bands that have great songs. Some particular songs that have inspired us are CRYSTAL CASTLES ‘Not In Love’ featuring Robert Smith from THE CURE, DEPECHE MODE ‘Enjoy The Silence’, COLDPLAY ‘Viva La Vida’ and NINE INCH NAILS ‘Hurt’. What is the songwriting and studio dynamic between yourself and the other STRANGERS Piers and Raife? Well I’ve usually got an idea on Garageband that we’ll work with when we’re together. Raife will work on some beats and Piers will be on hand to add input to the melodies. It just kind of comes together, but there always needs to be that nucleus of an idea to start from. 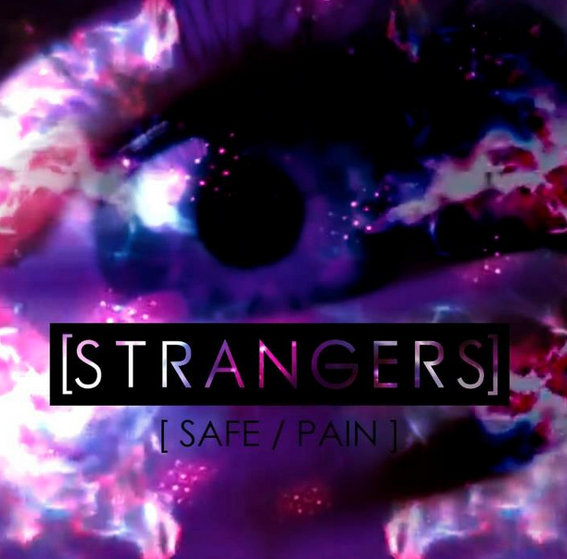 STRANGERS are quite unusual in some respects within the electronic genre due to the soaring anthemic nature of songs like ‘Shine On You’ and ‘Safe/Pain’. How does your more conventional musical background shape your outlook? Well I was brought up listening to Christian Music, which by its very nature has to be something a whole crowd can sing along to so I guess that’s informed my songwriting. Are you in danger in becoming the COLDPLAY with synths or would you be happy with that description? We’d definitely take that, COLDPLAY write brilliant songs. They are only considered uncool because they are so popular. British people don’t seem to like winners. I guess some of that has come from listening to dubstep/post-dubstep stuff which is like electronic grunge music. Half time beats give songs a really powerful vibe. We won’t always be using this kind of beat though it’s just what we’re into at the moment. Interestingly, the Sensual Harrassment mix of ‘Shine On You’ have more mechanised percussive elements and have added a different dimension to those tracks. 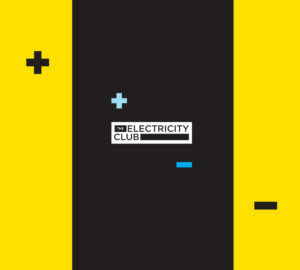 Have you any views on remix and club culture’s development and what role it has to play within your music? I love hearing remixes that give songs a whole new vibe. I’m not really very well-versed in club culture as such but I know it does have a massive role to play. Sometimes remixes become more popular than the original, which is no bad thing, and it also allows both artists fans to pick up on the other. It’s win/win. This would be interesting…..hehe! Raife loves them! STRANGERS take great pride in their visual presentation with videos and live projections yet manage to retain an element of mystery to proceedings. How important do you consider this aspect of the band? It is very important as it shapes how you enjoy your music. You can bring out aspects of the song and make people think differently about the music in the way you visually present yourselves. We are still developing this area of our work and excited about the future in terms of new videos and live visuals. So how do you really feel about those comparisons that the press and blogs make about STRANGERS particularly with HURTS? People always have to compare, so as long as we’re getting written about it’s all good. You seem to have released quite a number of songs since putting a photo of a provisional album tracklisting on your Facebook? How is the album coming along? The album is shaping up, we are aiming to have it finished by October and released early next year…. Which of your songs are you most proud of and feel have captured the hearts of music enthusiasts? Tricky, it probably has to be ‘Shine On You’ or ‘Safe/Pain’, as they are really anthemic. We always strive to write anthems. We have another song on the way called ‘Dreams’, this is slightly darker lyrically but has a really uplifting chorus. ‘Bound By The Sea’ is a particular favourite here at TEC HQ. And will it be on the album or become one of those that will be set to gain legendary B-side status? Probably not on the album, one for the fans to collect I think. We love that track live, we forgot about it until the other day in Northampton and it was great to play it at The Labour Club. You’ve supported several classic electronic artists such as BLANCMANGE and CLAUDIA BRUCKEN plus played the BASII Festival celebrating the music of DEPECHE MODE. Are you worried about the possibility that you could be labelled a Synth Britannia support act in the way MIRRORS kind of were after they supported OMD, GARY NUMAN and HEAVEN 17? No definitely not, we have plans to tour with many artists, both old and new, so we’re not worried about that. We felt privileged to be asked to support these bands though as they have some great songs. You’ve been quite keen on doing cover versions such as TEARS FOR FEARS ‘Shout, JAPAN’s ‘Ghosts’ and LANA DEL REY’s ‘Video Games’. Now there’s your cover of HADDAWAY’s ‘What Is Love?’ How did this all come about? We love putting our own spin on songs we love, and it’s a great way to give something to the fans for free. Your music has been used by BBC in various sports coverage. How did you feel when you saw the clips? Buzzing! Raife’s a big sports fan so when we he hears our music over their commentary he literally loves it. What are your hopes and fears for STRANGERS? We hope that our worst fears stay in the closet.